It is with deepest sorrow and regret that I have to tell you that my husband, James D Quinton, took his own life on 6 September 2012. I would be extremely grateful to you if you could help to memorialise/archive his work, and spread the word around the small press/poetry/writers community. Please feel free to contact me at the above email address if you would like any further information. James D. Quinton was a self-taught writer and a publisher of an edgy poetry/fiction magazine for over ten years known far and wide as Open Wide Magazine. I first communicated with James early in the last decade when we were both banging around the small press across the globe, he far more published than I. Open Wide published established and emerging poets from all corners of the earth and James gave many their first chance at publication. I was fortunate enough to have made two appearances in OW over ten years. 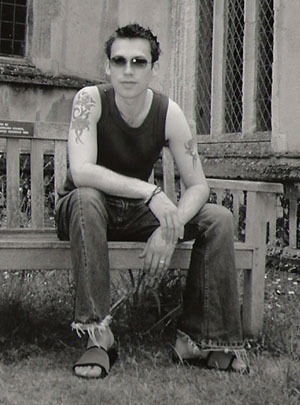 James published several collections of poetry and fiction under the xplosive books imprint. Here at The Fox Chase Review we were pleased to publish the poetry of James in two editions and to have published an interview with James at our blog. I do not know why James felt it necessary to take his own life, all I know is his was a life cut too short. Diane and I, Sandra and T.G. extend profound sympathy to Amy and do hope she finds peace and comfort as she tries to understand why James decided to move on. Please feel free to leave a comment or a link to James work on line.